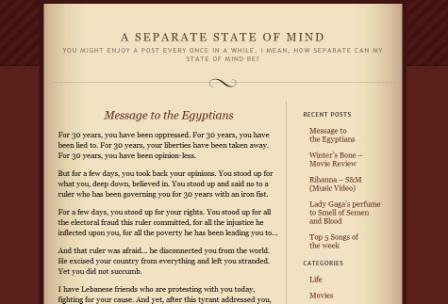 Screenshot of "A Separate State of Mind"
MIND SOUP: A Separate State of Mind is a new blog on the Lebanese blogosphere which discusses life, music, politics, movies and thoughts of a Lebanese youth, Elie, who is one of my best friends. I have been trying to get Elie to start a blog since I created Mind Soup two years ago (2nd birthday coming up on Feb 21 :D) but his laziness and procrastination delayed it. 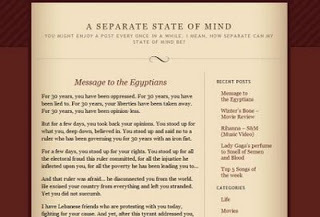 He has had some guest posts here on Mind Soup but now he took the plunge and after some quick trial with tumblr, he started his full wordpress.com blog: http://stateofmind13.wordpress.com. He's a huge Carrie Underwood fan that I started calling him a Carrieoholic.So you should definitely expect to see some posts about her. He likes to watch movies, and I mean a lot of movies, so he will be posting some movie reviews. His taste in movies is usually good (except for the Batman: The Dark Knight -- which I still believe is the worst movie ever made). He is an Apple fanatic, actually obsessed with everything Apple from Macs to iPhones to Apple underwear :P -- this is probably the most thing I disagree with him about, but I'll leave that rant for a different post. He's very much into Lebanese politics (and American politics as well) so you just have to poke him to get a fire going. He's the kind of person who stays up till 4:00 AM to watch an event live on TV rather than watching the rerun later in the day.